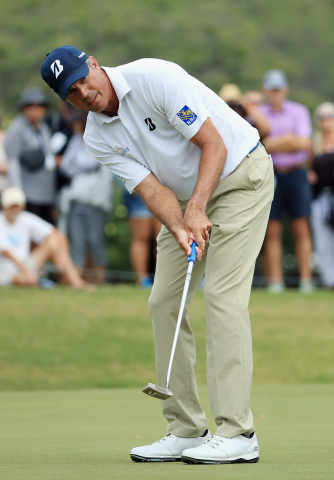 MANHATTAN BEACH, Calif.--(BUSINESS WIRE)-- Skechers USA, Inc. (NYSE:SKX), celebrates Olympic medalist and Skechers Performance ambassador Matt Kuchar’s victory at the Sony Open at Waialae Country Club yesterday in Honolulu. Kuchar—who competes wearing Skechers GO GOLF footwear—finished at 22 under par overall for his second title this season, moving him up seven slots to 2nd place in season points for the FedEx Cup. Kuchar has been a leading and respected golfer since breaking onto the golf scene as the U.S. amateur champion in 1998 and as a pro he remains a perennial fixture atop leaderboards. He earned two victories in a season for the first time in 2013 and also helped the U.S. squad beat the international team at the Presidents Cup. In 2016, Kuchar won a bronze for the United States at the Olympics and was also part of the victorious U.S. team at the Ryder Cup. The 2019 season is already turning out to be notable, as he’s now earned multiple titles in a single season for only the second time in his career. With 100 top-10 finishes since 2001 and nine overall Tour titles, Kuchar currently sits at number 22 on the Official World Golf Rankings. Skechers Performance GO GOLF is available at Skechers retail stores and skechers.com as well as select retail partners including specialty golf pro shops. Based in Manhattan Beach, California, Skechers designs, develops and markets a diverse range of lifestyle footwear for men, women and children, as well as performance footwear for men and women. Skechers footwear is available in the United States and over 170 countries and territories worldwide via department and specialty stores, 2,802 Skechers Company-owned and third-party-owned retail stores, and the Company’s e-commerce websites. The Company manages its international business through a network of global distributors, joint venture partners in Asia and the Middle East, and wholly-owned subsidiaries in Canada, Japan, throughout Europe and Latin America. For more information, please visit about.skechers.com and follow us on Facebook, Instagram, and Twitter.